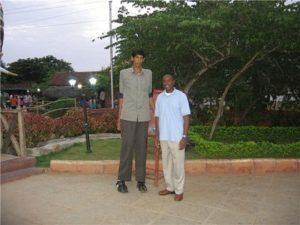 These top 10 tallest men in the world today are still alive and were awarded by the Guinness Book of World Records for their incredible heights from standing some feet above from the usual heights of persons. See their incredible physical assertiveness and descriptions. 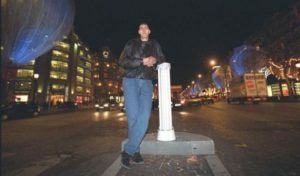 Radhouane Charbib was born on October 27, 1968, well recognized by the Guinness Book of Records as one of the tallest man living in the world until Bao Xishun claims it on January 15, 2005. Charbib was living in the dull town of Tunisia with a simple family. At the age of 47, he enjoyed the advantages of his height with his wife and people who love him and accepted his being different. Bao Xishun is 66 years old has always enjoyed good health for one who is so tall, Although Bao experiences some difficulty walking but he has made a good living from his many promotional & public appearances. In 2006, Bao Xushun got honored of the title by Guinness In 2006 and held the award until 2009 when he lost it to the current holder of the record. He was of normal size until the age of 16 when he suddenly experienced a seven-year long development spurt that resulted in his extreme size. Naseer Soomro is a Pakistani journalist, linguist, critic and bilingual poet was born on March 28, 1964. 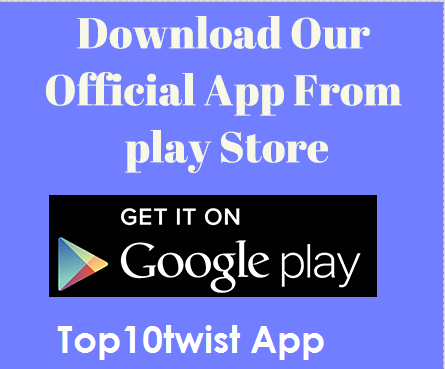 Aside from being a professional in his field of work, Naseer is an author of published works and books. His names are mentioned in the Oxford English-Sindhi Dictionary published by Oxford University Press, Karachi. Similarly, he also works as a freelance editor. Naseer Soomro became popular when it comes to his passion for journalism and poetry though his height is extraordinary. This 24-year man Asadullah Khan is reported having a hard time finding bliss in life due to his extraordinary height. These problems for him also include difficulties in buying shoes that will fit for him. When his father died, the family’s burden was put on him. 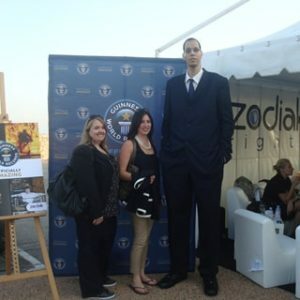 His height seems to be a major problem up until he was yet recognized in the Guinness World Records together with the other tallest man on world alive. Zhang Juncai came from a small region of Shanxi, China. 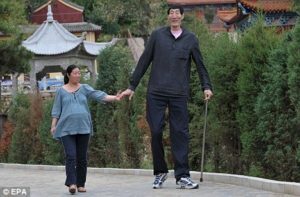 He was born on 1983 and was confirmed as China’s tallest man on 23 Nov. 2004. Zhang was measured on a Japanese TV show and it turned out he should have held the title after all, for he was reliably shown to be seven feet eleven and a quarter inches tall. The details about Zhang Juncai is somewhat insufficient, his birth year is reported as anywhere from 1967 to 1983 and apart from his well publicized 2009 hospital visit to the World’s tallest woman, the late Yao Defen who measured seven feet eight inches tall, he appears to avoid the limelight that many of his fellow huge celebrate in. 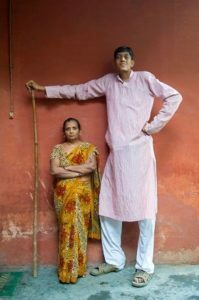 Dharmendra Pratap Singh is the tallest man of India living today. Dharmendra also finds it hard to find a life partner for him. 32-year old Dharmendra from Meerut, Uttar Pradesh is struggling to survive a normal life due to his disorder. He took up work as a freak show performer at an amusement park where he used to spend his days in a cage like structure selling photographs to paying customer at a low salary. 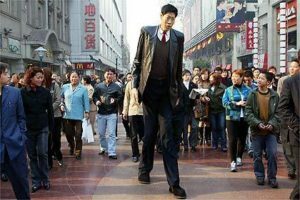 Suddenly, The honored the Guinness World Records for the tallest man on the planet made him changed his perceptions in his nature. 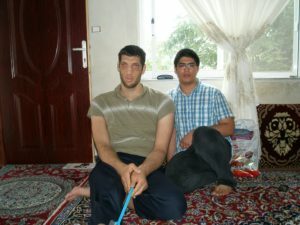 The tallest man in Iran is Morteza Mehrzad who is also the World’s tallest Paralympian. Morteza was born on 1987, helped the Iranian national team win the Gold medal in the sitting volleyball event at the Rio Summer Paralympic games which makes him the tallest ever winner of an Olympic Gold medal too. When Morteza was 16 years he was six feet four inches tall but after an accident on his bicycle that injured his pelvis, he suddenly started growing unnatural. His right leg didn’t develop compare with another part of him and is now 6 inches shorter than his other leg meaning that he doesn’t walk normally without assistance, however t he is entirely healthy and plays sitting volleyball in his city at club level and coaches other positive future Paralympians in the sport. 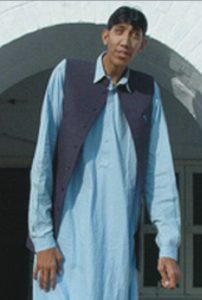 Brahim Takioullah is the holders of the Guinness World Records for the tallest people living today. Brahim was born on January 26, 1882, in the Southern town of Guelmim; He experienced a healthy life until the age of 13, where he grows rapidly. 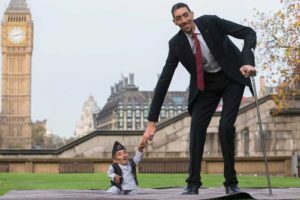 Apart from gaining a world record for tallest man, Brahim also sets Guinness World Record for longest feet. Acromegaly is also the reason for his unusual growth. However, Brahim cannot stand up straight in the small flat street, he has also difficulty getting into a taxi or train, and can never move without attracting people’s attention. Despite this, he remains happy in his situation and posting gladly to individuals in public and answers politely interviews about his condition. 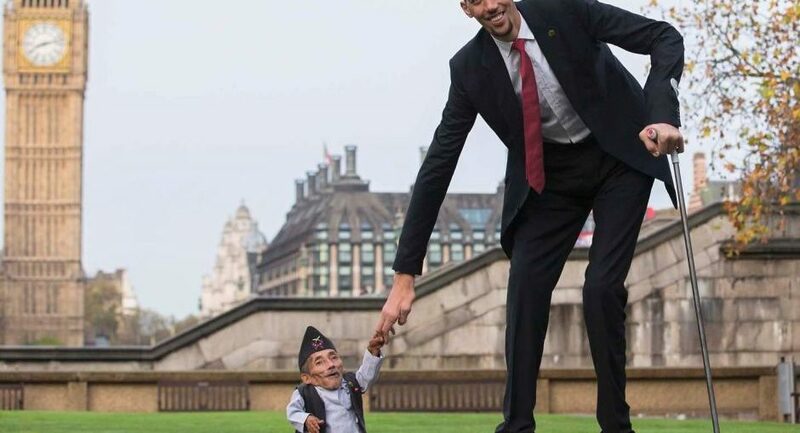 Today, The World’s tallest man living on Earth is Sultan Kosen. At the age of 33, he enjoys his crown in the Guinness World Records since 2009. Sultan is a farmer and living a simple life with his family in Mardin, Turkey. Just like other tallest men, he also has hyperpituitarism condition.